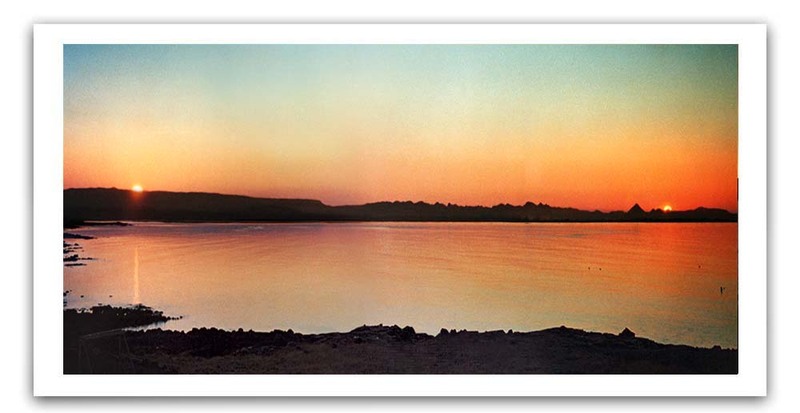 The pictures, which form the piece Sunrise, sunset, were shot on the shortest day of the year 1973. On that day was born the idea to make it into an art piece which I would name Moment. When I saw the photos, I decided to splice them together in one image that would symbol our lives. I did many experiments with different instruments at different times, but it was not until 2003 that I had all the equipment, computers, scanner and other, to make it happen. After these 29 years that had passed since I took the pictures the films were not in the best condition, but the images were scanned in, cleaned, repaired and merged together. To merge together images taken at different times of the shortest day was not as easy then as it is now, since there is much color difference in the morning and the evening, but I did it, successfully and the art piece “Sun rises, sun sets” was born. The art work represents birth and death and the moment between these two factors, the existence of us all. When the first part of the project had become a reality it was somewhat natural to make the second part, which would represents death and the birth of new life and the moment between those two factors. It was much easier as digital cameras were now part of my tools and the shortest night of the year 2005 was born the art piece “Sunset, sunrise”. Together, form these two pieces the art work “Moment”. 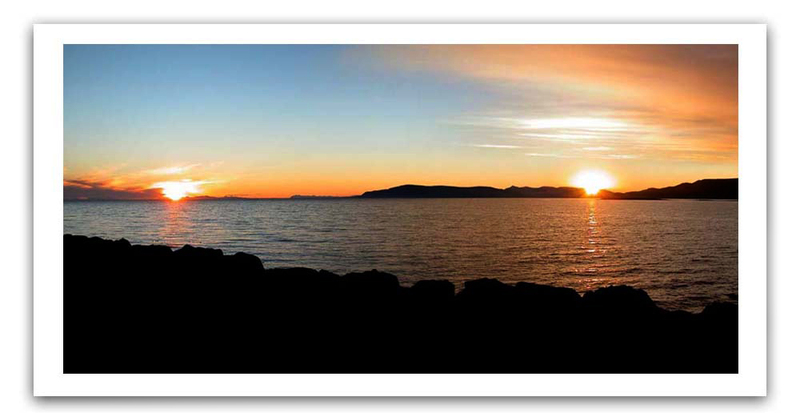 Sun rises, the sun sets and between these two factors is but a short distance. Moment. Thus, it is also in people’s lives. People are born and they die, and in between these two factors is a short distance. Moment. As the sun rises, we are born into this world. In the beginning the way is easy for small feet, with most of. Then we fall into the teenage years, and we become all kinds of things, too big, too small, too fat, too thin, homosexual and heterosexual, in love and everything in between. Endless ideas. Endless too much or too little. From then on the way is not as easy. We walk our road over soft sand and sharp rocks, and often up and down the slopes, until we reach the final mountain to climb, and when that is done our walk is over. And we disappear in the ocean of life ever after. Sun sets, sun rises and between these two factors is but a short distance. Moment. Thus, it is also in death. People die and are born, and in between these two factors is very short distance. Moment. As the sun sinks into the sea we disappear form this this world into the ocean of eternity where we unite and become one. There is no I, no you, no he or she. No ideas. Nothing too much or too little. Nothing. What we in fact are. Life. And before the moment is over a fetus is growing in its mother’s womb. When it is fully grown raises a new individual. New me, new you, he or she. New life, but still the same. A short distance. Moment.